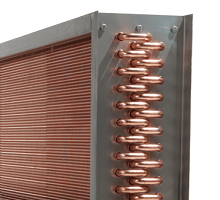 Our chilled water coils are available in same or opposite end designs with a wide choice of tube, fin and material options along with multiple circuitry availability. 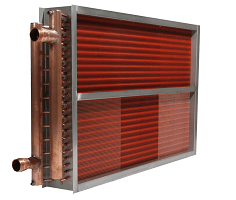 All coils are constructed with plate fins and seamless tube construction. Optional Sentry Guard™ freeze resistance available. 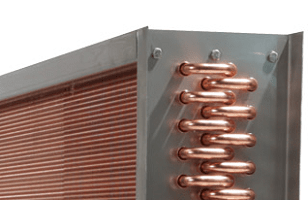 USA Coil & Air has an extensive library of OEM designs and can help with the replacement of all major OEM manufactured coils, including but not limited to: Carrier, Trane, McQuay, York, Heatcraft, Aerofin, American-Standard, Bohn, Colmac, Marlo and more. 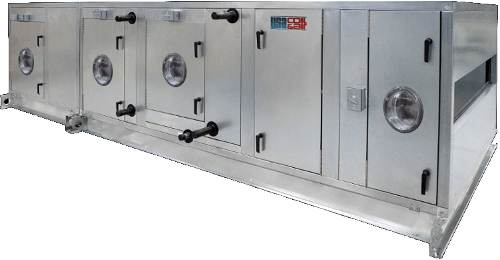 The equipment USA Coil & Air builds is specially made to order to meet your exact engineering requirements but we also understand time critical projects require quick turn around. Our expedited production program allows us to offer coil shipments in as little as 10, 5, 3 and 1 working days guaranteed. See our Shipping Schedule for all other HVAC equipment offered. Please call us at 800-USA-COIL! Or send us a message using the form to the left. Secondary surface (fins) shall be of the plate-fin design using aluminum or copper, with die-formed collars. Fin design to be flat, waffle, or sine-wave in a staggered tube pattern to meet performance requirements. Collars will hold fin spacing at specified density, and cover the entire tube surface. Fins are to be free of oils and oxidation. Seamless copper tubes shall be mechanically expanded into plate aluminum or copper fins to form an everlasting bond between primary and secondary surfaces. 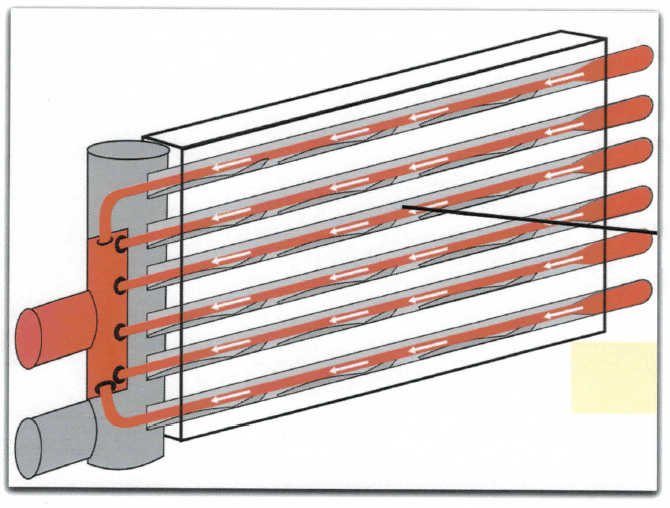 Tubes are to be mechanically expanded into fins (secondary surface) for maximum heat transfer. 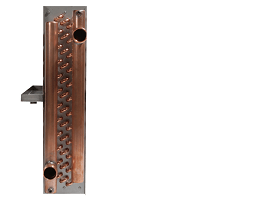 Headers (manifolds), if required, shall be constructed of a minimum .060” wall seamless copper. 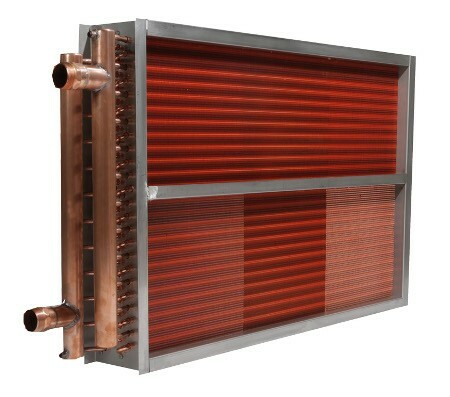 Die-formed copper end caps are brazed on the inside of the headers, and rounded so as to prevent excessive pressure drop. (Unless spun-closed — for sizes up to 1-3/8”) All coils shall be provided with 1/4” vents and drains. Connection is to be sweat type (SWT), MPT or FPT Grooved or flanged as required. Coil casing material shall be galvanized steel at a 16 gauge minimum. 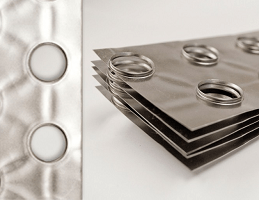 Heavier material, stainless steel, copper or aluminum casings are available as required. Intermediate supports are required every 42” of finned length and shall be bolted to top and bottom casing channels. Coil casings on top and bottom of coils are to have double-flange construction, allowing for vertical stacking of coils. Coils shall be tested at 550 psig using dry nitrogen, submerged under water. Dual-operator verification shall determine that all coils are leak-free. 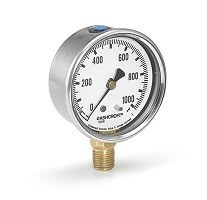 Fluid coils are guaranteed up to a maximum 300° F operating temp, and 250 psig maximum operating pressure. All fluid coils designed with 1/2” or 5/8” tubes are to have ARI Standard 410 certification and shall bear the ARI symbol. Coils outside the scope of ARI’s standard rating conditions or certification program will be acceptable to ARI since USA Coil is a current member of the ARI coil certification program, and coils will be rated in accordance with the ARI Standard 410. So… You Think Coil Quality is an Easy Task?